Modern apartment with two bedrooms have double beds, and a bedroom with a bunk bed. The apartment is spacious and bright. It has two comfortable bathrooms, newly renovated and well-equipped kitchen including oven gas engine, express coffee machine and toaster. As an alternative to a day at the beach, relax on the porch and enjoy a cold drink and grilled food while watching the boats, the sea and the beach. The apartment is located in Povoa de Varzim with several beaches (blue flag quality), and has a fantastic view of the sea. A few minutes walk from numerous restaurants with traditional Portuguese food. Several nightclubs and Casino (to 500m). Good conditions for water sports (sailing club to 150metros). The area receives few foreign tourists and local tourists are a phenomenon weekend. A few meters away is a nice bakery offering fresh bread, cakes and pastries at a cheap price. In parallel streets the beach will find small local shopkeepers with regional products (vegetables, fruits, flowers and grocery). At auction (place of arrival of the fishermen) can purchase a wide variety of fresh fish even at very cheap price. The apartment watching the marginal offering a fantastic journey along the beaches for bicycles, skates, a simple walk or going down of the sun. The host Patricia was very kind. The appartment was somewhat dated. The pictures looked Better. Despite all this I was glad I Could do some washing and cycling with my little girl in the back. I feel bad for saying because the location is great! Hopefully some flaws Could be fixed. A anfitriã muito solicita e pronta a ajudar em tudo. Local excelente. Único problema foi que o sinal da internet só pegava na sala. Très bien situé, balcon confortable, les propriétaires gentils et discrets, l'appartement vaste et bien agence, cuisine complète, en un mot fait pour les vacances. 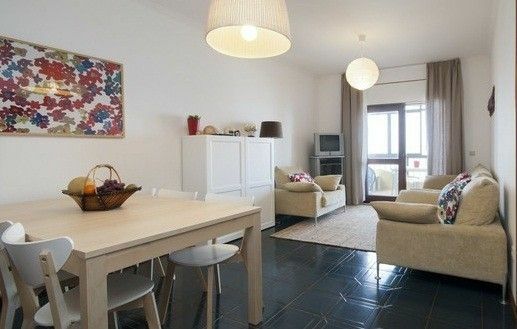 El apartamento se encuentra muy bien ubicado entre Povoa do Varzin y Vila do Conde, con unas vistas inmejorables y a muy pocos metros de dos playas. El mobiliario e instalaciones de las que está dotado son realmente buenas, y su estado es perfectos. Tiene servicios a muy poca distancia. La atencion de los propietarios es excelente. El único posible reparo es que al ser un tercer piso sin ascensor pero las escaleras son cómodas. Con lo cual es muy recomendable para aquellos que no tengan problemas para subir y bajar escaleras. Apartment with 120 m2, situated opposite the beach, just minutes from a metro station that will take you to Porto, Matosinhos, Maia and Vila do Conde (stop at the airport). It has a double bedroom, a double bedroom with two double beds, one bedroom with a bunk bed, bathroom, shower room, living / dining room and kitchen. the living room has a sofa bed for two and a balcony overlooking the sea. This apartment is on the beach front, with great views of the beach. Ideal for holidays without using the car. Desconto para estadias superiores a 1 semana. Discounts for stays longer than one week.